WDH has been working with the internationally-renowned arts gallery to run arts classes and activities across the Wakefield district. 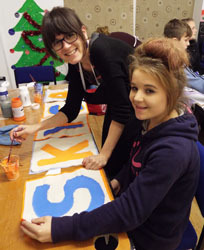 South Kirkby Youth Community Association (SKYCA) the latest group to benefit from this, with teenagers working with Hepworth employees to create a sign for their club using textiles and paints. 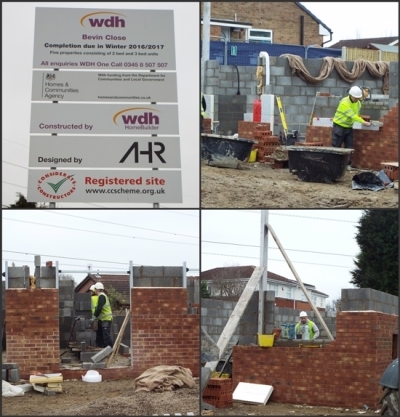 The finished sign will be put on display in the windows of SKYCA’s premises on Mill Lane, South Kirkby. Jane Gwilliam, WDH’s Tenant Involvement Officer, put The Hepworth Wakefield in touch with SKYCA after working with the youth club on a regular basis. Jane said: “We’re pleased to be able to put The Hepworth Wakefield in touch with local community groups because it helps people benefit from activities which they may otherwise not be able to take part in. attend the Youth Club have showed their creative talent - they all told me they felt really proud of their new sign. 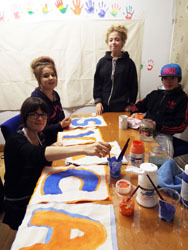 Younger members of SKYCA have previously taken part in soap-carving sessions with Hepworth employees. South Kirkby Community Youth Association hosts activities for young people on Mondays, Tuesday, Thursdays and Fridays. Activities for seven to 12-year-olds run from 5 pm to 7 pm. Activities for 13 to 17-year-olds run from 7 pm to 9 pm.